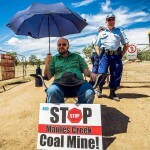 Protesters have “immobilised” a drill rig at the Maules Creek coal mine, early this morning. 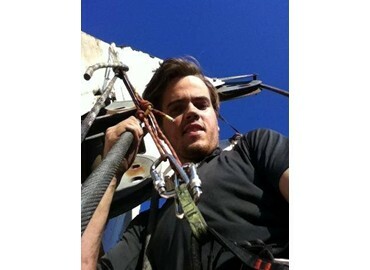 Sydney man Michael Poland, 21, scaled the mast of a drill rig while Christina Hobbs, 30, locked herself to a bulldozer. Photographs taken during the incident this morning were posted online by the people involved. “This mining development, this government and the police, by enforcing unjust restrictions, are acting to protect economic benefit of a few mining magnates above the basic human rights of the community,” Poland said. Poland referred to an incident late last week in which Maules Creek resident and Boggabri parishioner, Wilma Laird, was prevented by police road blocks from attending church services over Easter. 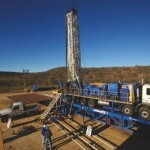 A spokesperson for mine operator Whitehaven said that this activity has been going on for six months, and that the company has “got used to it”. “The police get involved very quickly, and the people involved are arrested very quickly,” the spokesperson said. There have been around 120 people arrested at Boggabri in similar incidents since December. 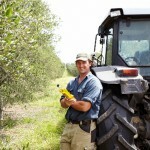 “We’re getting pretty used to it now, usually they actually stop us from doing anything,” he said. The rig was not manned at the time that the protesters interfered with the equipment. “He just abseiled himself up the rig and hung from halfway up the mast,” the spokesperson said.